John Lennon's former wife Yoko Ono and the musician's many fans have mingled in Strawberry Fields, New York, to mark the 25th anniversary of his death. In his home city of Liverpool devotees released hundreds of white balloons bearing messages into the sky. The former Beatle was shot in Manhattan on 8 December 1980 by Mark Chapman, who is now in a New York prison. In a newly released interview, Chapman describes his "compulsion" to kill Lennon as "like a runaway train". 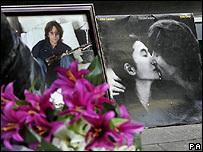 Lennon had just turned 40 years old when he was shot and killed in New York. Martha Wagner, who came to Strawberry Fields in New York's Central Park, remembered the moment she heard her hero had died. "My heart stopped. I screamed," she said. "His message is still the same: peace and love and live the best you can." More than 1,000 messages to Lennon were tied to the balloons released from Liverpool's Albert Dock at 1200 GMT. James Andrews, nine, from Bournemouth, was one of the youngest fans to take part in the balloon release. He said: "I just wrote Merry Christmas John on my balloon. I love The Beatles and especially John Lennon." On both sides of the Atlantic there were tribute concerts and radio broadcasts. Paul Weller and Jamie Cullum were among musicians paying tribute at the concert at London's Abbey Road studios. BBC Radio celebrated the work of the former Beatle with its Lennon Night on Radio 2. 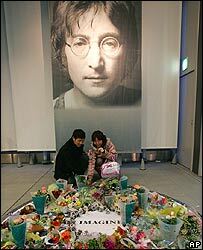 Badly Drawn Boy, Sugababes and Katie Melua were among other artists taking part in the concert, featuring re-interpretations of Lennon songs. The transmission was broadcast simultaneously on Radio 2 and across the US on Sirius Satellite Radio, from Manhattan, New York. 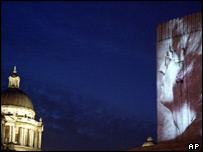 In Liverpool, the city of Lennon's birth, images of the singer were projected on to the George's Dock building. A civic service to celebrate his life took place at Our Lady and St Nicholas Parish Church, opposite Pier Head. A one-minute silence was held at Virgin Megastores in central London at 1100GMT. It was the first time in the store's history that trading ceased to salute a music artist. A major exhibition on the musician and his work is currently being held in Paris. In addition to the special events, a number of television programmes have been produced examining aspects of the singer's life and the circumstances surrounding his death. A documentary about Mark Chapman, the man who killed the singer-songwriter, has already prompted anger from Lennon's family. The Channel 4 documentary, I Killed John Lennon, which was broadcast on Thursday night featuring recordings of Chapman taped by his biographer in 1990, has been criticised by the singer's cousin, Stanley Parkes. Mr Parkes said the broadcast glorified a murderer, although Channel 4 has denied the claims, adding that the neither the killer or his family had received payment.